Vitamin E combined with Sweet Almond Oil, Shea Butter, CoCo Butter, Beeswax. Protective and healing. 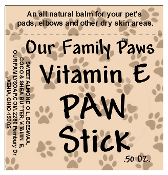 Use on your furry family member's dry skin, cracked pads, callused areas. Use it as part of your routine grooming and your pet will be the talk of the pack. Packaged in a convenient half ounce twist tube.